From what I can tell they are 2x4gb sticks running @ 3000mhz slightly they would run @ 2933mhz. Find the RAM you like, and select it. 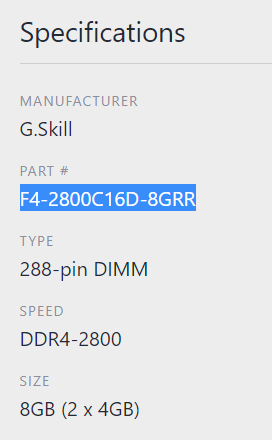 Go to the list, press Crtl+F, paste the part number, and if there are any matches, then your RAM should be compatible, if not, keep looking. That one shows up on the list, and the 4 DIMMs seem to be working when populated, so I think we found your RAM. And it's 3200MHz so even better. Build is a bit over budget but not by much. No accurate way to tell. What I can tell you is that a Coffe Lake rig will be more expensive than a similar Ryzen rig. That's how it works most of the time. Usually the way it goes is this: Intel offers better stuff than AMD, so let's say AMD's best processor has a performance of 1, and costs $100. Intel's best processor will probably have a performance of 1,5, and will cost $250-300, so if you go Intel, you can have a computer with a performance of 150% of what AMD can offer, but you have to pay 3 times as much (that was the case with the 6800K and superior models a while ago). Also, if you want to buy an Intel that has a performance of 1, you'll pay $150. That's pretty much how it has been for a while. This are just very silly numbers, but you get the idea. Some of the Ryzens required you to have a very good cooling system such as water cooling. AMD CPUs are known to run hot in history. Intel CPU runs fine with stock cooling and they are 100% IBM compatible. AMD is not. Nevertheless AMD gives you plenty of bangs for the bucks. It gives you budgeteers a chance for competitive systems. LOL, didn't IBM compatibility stop being a thing at the turn of the millennium? No, Intel own that copyright. AMD cannot make their CPUs 100% compatible.